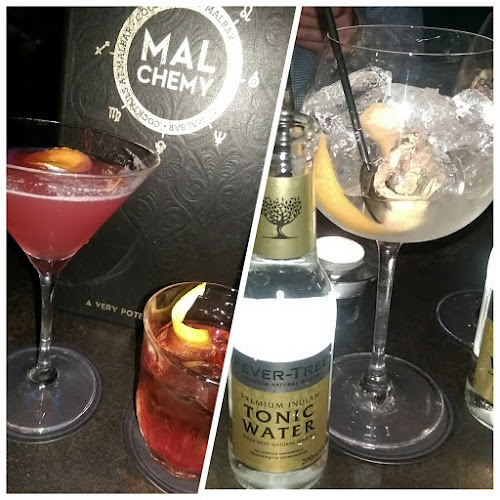 It doesn't seem that long ago that acclaimed chef Martin Wishart announced that he would be opening The Honours at Malmaison Glasgow but the restaurant has actually been operating since November 2014. As a slightly belated birthday celebration, the restaurant recently hosted a fantastic lunch event, 'The Honours Uncovered', which allowed diners the chance to get a sneaky peek beyond the usual dinner service. Myself and Nicola were fortunate enough to be invited along by the restaurant's PR company and when we arrived for the champagne reception just after 11:30 on a cold and snowy Saturday morning, the restaurant bar area was already full of eager diners quaffing glasses of bubbly like there was no tomorrow. We found a space at the bar and settled down in anticipation of the afternoon's entertainment. I should probably mention at this point that this was no ordinary lunch event - in fact, this was a big deal as in addition to the champagne and canapés that we received as we arrived, we would also be served a four course lunch menu with matched wines, as well as receive some wine tasting tips from the restaurants sommelier. Oh, and we would be shown into the kitchen where Martin Wishart would demonstrate a couple of his restaurant dishes with the help of business partner and head chef of The Honours Edinburgh, Paul Tamburrini, and pastry chef at The Honours at Malmaison, Rikki Preston. Martin is regarded as one of the UK's top chefs, holding one Michelin star at two separate restaurants in Scotland. The first is at his eponymous Restaurant Martin Wishart in Edinburgh, whilst the second is at Martin Wishart at Loch Lomond which is located at Cameron House Hotel on Loch Lomond. We already felt very privileged that we would be eating from a menu prepared by a Michelin starred chef so getting the chance see Martin demonstrate his cooking was a real honour(s). 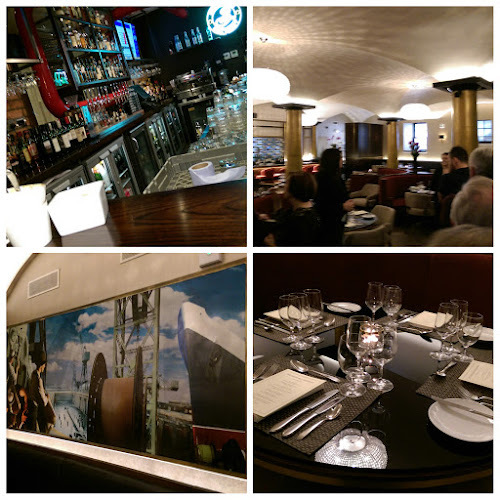 The diners were split into three groups and shown into the kitchen to the waiting chefs. 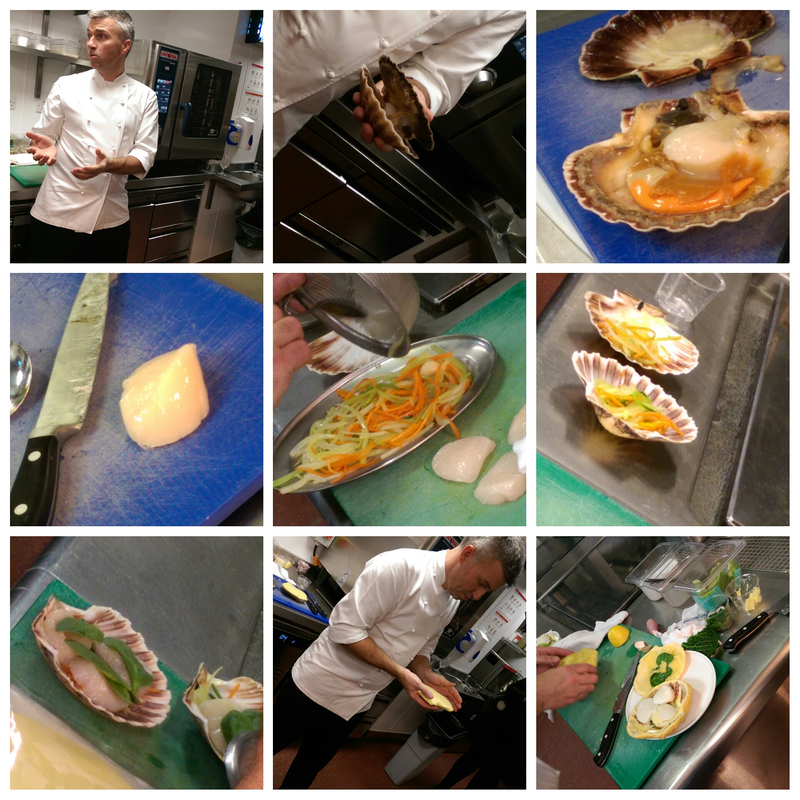 The group that we were in were introduced to Martin as he set about demonstrating a couple of his favourite dishes. He first was a simple scallop dish where the scallop was baked in its own shell under a buttery pastry lid. This dish could wily be recreated at home and would make a fantastic starter for a special meal. 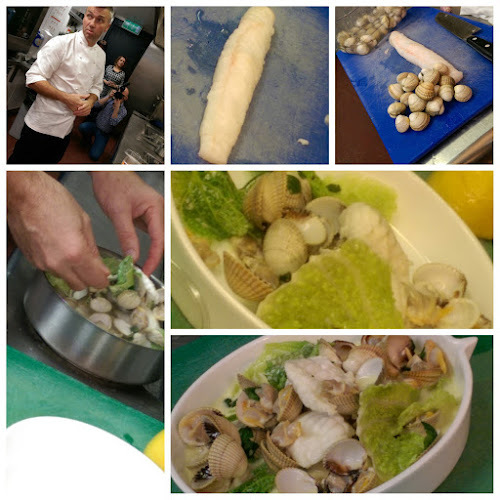 The second dish was a quick and easy monkfish dish served with clams and savoy cabbage in a vermouth cream sauce. Both of these dishes epitomised the cooking style of Martin Wishart with seasonal produce being used to create simple uncomplicated and delicious meals. We were given recipe cards for each of these dishes to take away and try at home.... All I need now is a free weekend and I'll let you know how I get on. After the cooking demo we were shown through to a meeting room on the other side of the bar where we were given a quick-fire wine tasting session featuring some of the wines that we would be enjoying with our dinner. It was very interesting hearing different peoples thoughts on the white, red and dessert wines that would accompany our meal. What was more interesting was noticing the big difference in drinking wines on their own and seeing how they differ when they are served as matched wines with food. I've been lucky enough to enjoy a few wine flights on recents months and have to say that if I could afford it, this is the way that I would enjoy every meal. The first course to arrive was Foie Gras Mouse with pear foam, sweet & sour reduction and rye bread. This was matched with a fresh 2015 Prinz Von Hessen Riesling from the Rheingau region of Germany. The foie gras mousse was deliciously rich whilst the pear foam helped bring some balance. I didn't detect the sweet and sour reduction but that didn't matter, this little entré was a great start to the meal. The next course was a wonderful starter of Loch Fyne Crab Marie Rose, white radish, espelette pepper and wheat cracker. The sweet crab was balance perfectly with a sharp Marie Rose sauce whilst the radish and pepper added a nice balance of texture. Nicola and myself love crab and both made short work of this starter. 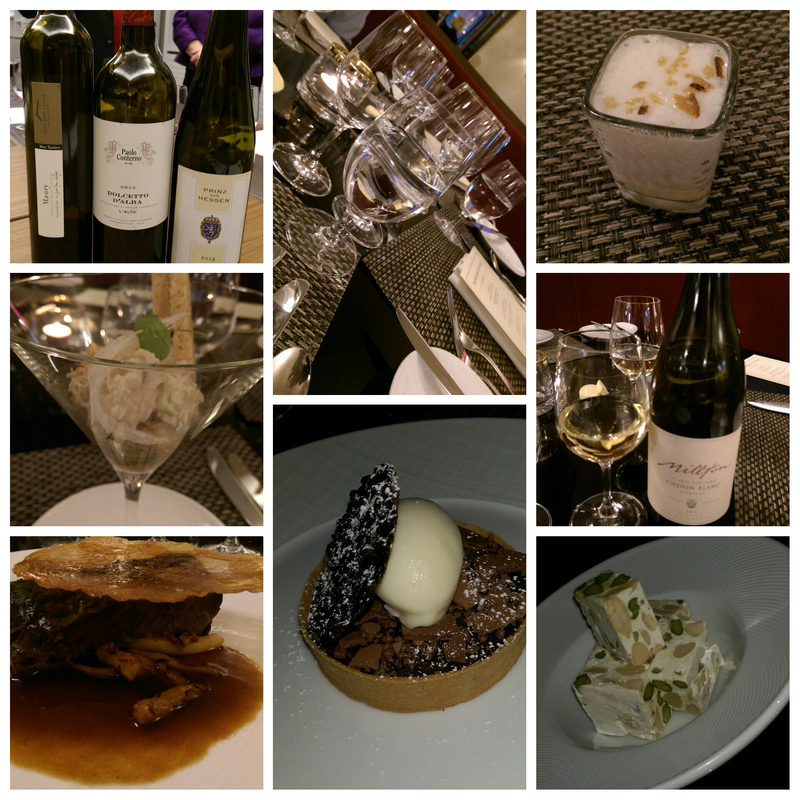 The matched wine was a 2014 Chenin Blanc from the Te Arai region of New Zealand. This wine was light and crisp and a perfect foil to the sweet crab. The main event was Aromatic Braised Short Ribs with honey roasted parsnips and potato crisp. This was matched with medium bodied 2012 Dolcetto D'Alba from the Italian region of Piedmont. Wow! The beef was flavoured with the spices of the Orient, perhaps as a nod to the up and coming Chinese New and so tender that it fell apart at the slightest resistance. We both enjoyed the delicate spicing of the beef which worked incredibly well with sweet parsnip chips and rich beefy jus. To add a little texture, there was a crispy potato crisp ring balanced on top. This Pomme Maxine certainly looked the part although I felt that mine was just a little overlooked and slightly bitter. Not that this mattered much as I finished the plate with no real concern ( and Nicola's too). 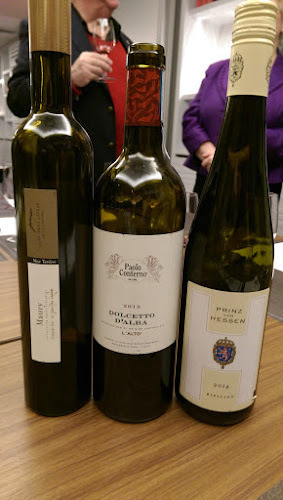 Picking up from the wine tasting earlier, most of the diners in my tasting group weren't overly impressed with the Dolcetto D'Alba when we tasted it on its own, commenting that we thought that it would be better with a good piece of beef. We were all right - the light, smoky red wine was a great match for the spicy notes from the slow cooked beef. Last up was our dessert of Valrhona Dark Chocolate Tart with white chocolate & vermouth sorbet and white chocolate scarf. This was matched with a 2011 Maury dessert wine from the Languedoc-Roussillon region of France. I love a chocolate tart and this was a great way to end our meal. The rich, velvety chocolate was delicious and slightly gooey whilst the pastry case was crisp and buttery. The sorbet was more like a creamy ice-cream and sweet from the white chocolate. We're not sure what happened to the white chocolate scarf, instead the pud was topped with a delicious dark chocolate tuille instead. The last matched wine was wonderful, pack with notes of raisins and apricots and a great balance to the dark chocolate tart. Feeling suitable stuffed, we retired to the bar for post-lunch cocktails and a cheeky perfect serve gin or two before making our way to Central Station for the Polar Express to snowy East Kilbride. We had a great afternoon at The Honours Glasgow at Malmaison and would like to that Martin Wishart and all the staff on duty for their hospitality on the day. I would recommend both the bar and restaurant at The Honours Glasgow. As well as boasting a fantastic collection of whisky, the bar carries a great range of premium spirits and craft beers, whilst the restaurant does a great job of balancing a comprehensive a la carte menu alongside fine dining. To find out more about The Honours Glasgow, check out their listing page on Citylicious. 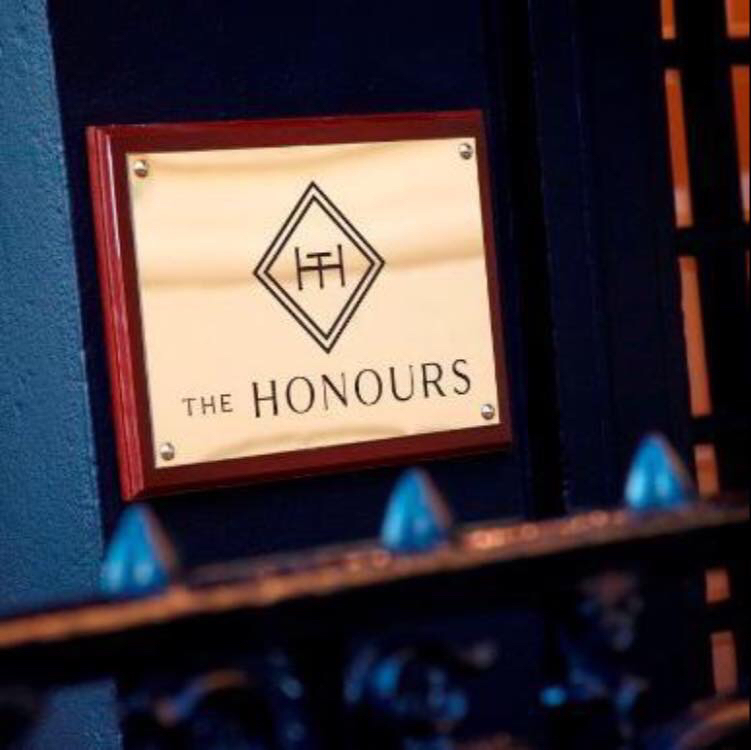 Keep up to date with all the news from The Honours Glasgow at Malmaison on Twitter and Facebook.